Over 10 Hours of Movies, TV Shows, Documentaries and Commercials! In the hearts of millions of television viewers of the last 60 years, there is, and always be, only one Lucy. Lucille Ball is a TV icon like no other. Voted by TV Guide as The Greatest TV Star Of All Time, her legacy on the small screen is unparalleled; a show business powerhouse and television pioneer. This unique Hollywood Profiles collection features highlights from Lucy’s incredible film and television career! Including 4 hilarious feature films, 10 outrageous television episodes, 2 insightful documentaries and a handful of vintage TV commercials, this is the ultimate tribute to America’s favorite redhead! One of my earliest memories is of my grandparents watching I Love Lucy. I used to sneak downstairs and watch from the stairway when I was supposed to be sleeping. 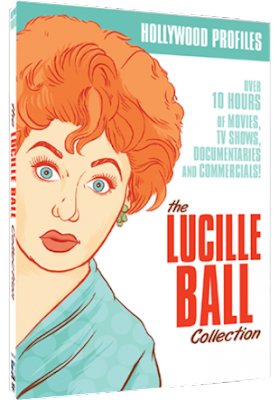 When I saw they were releasing the show on The Lucille Ball Collection on DVD, I knew I had to grab one because it brings back so many memories. This DVD includes ten full hours of episodes from the show, movies, and documentaries. Since so many of these stars have passed away, and it was wonderful seeing them again on the small screen. The documentaries are great because they give you a real personal look at the lives of the actors. Another fun aspect of this DVD set is that it includes the commercials that originally aired with the show. While today I tend to fast-forward through commercials, seeing these commercials from the 50s was a lot of fun and a real throwback. If you're looking for a blast from the past, this DVD is the perfect choice. I watched it with my mom, and it was like taking a step back in time. Any fan of Lucy is going to want this set in their collection. Grab your copy at Mill Creek Entertainment.